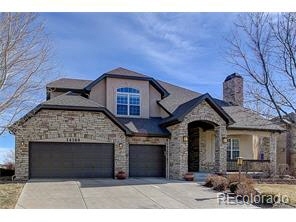 Description: Stunning custom home located in the gated area of the broadlands golf community. Upgrades and updates abound in this spacious 5 bedroom, 5 bath plus study filled with loads of natural light. Boasting a gracious kitchen, main floor master, finished basement and situated on the the golf course with a newer deck, patio and water features! New exterior paint. Great room tv is included in the sale.